4.0 out of 5 based on 39 bloggers and 7 commenters. 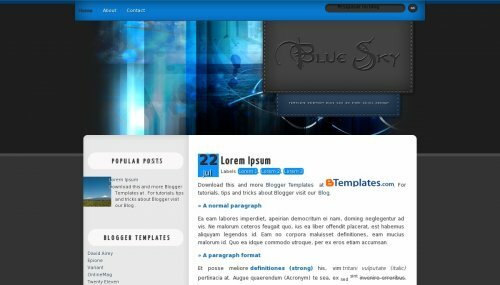 Blue Sky is a free blogger template with 2 columns, left sidebar, rounded corners, an exclusive design for Blogger, footer columns, abstract and gradients. Excellent template for blogs about halloween. @Isabella Felix Thanks to you! Love this template! How do I change the the Blue Sky on the header, to my Blog name and title under it? Can that be done? Thanks! !